The LIC North ferry landing at Gantry Park is projected to have the highest ridership outside of Manhattan, estimated to service approximately 4,000 daily trips. The Citywide Ferry landing for Long Island City North will be located off of Center Boulevard in Gantry Plaza State Park, the City Economic Development Corporation announced this week. 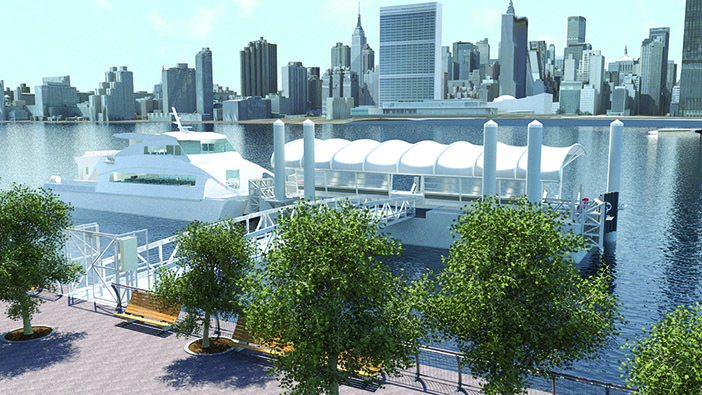 The EDC has indicated that it is in coordination with the State Parks Department to site the LIC North ferry landing adjacent to “a densely populated residential core.” The LIC North ferry landing is projected to have the highest ridership outside of Manhattan, estimated to service approximately 4,000 daily riders. The LIC North ferry landing, according to EDC, is part of the route which is scheduled to launch next summer. EDC indicated that the current ferry landing in Hunters Point South will continue to be part of East River Ferry operations until its integration into the larger Citywide Ferry Service network in 2017. Mayor Bill de Blasio announced in March that the seaborne service is on track for a 2017 start date. The Phase I Rockaway, Astoria, and south Brooklyn routes will be ready for the first 2017 voyages. When fully operational by 2018, the Citywide Ferry Service will carry an estimated 4.6 million trips per year across six routes. The plan still is for the ferry to be pegged to the price of a MetroCard, and launch at $2.75 per trip. The project is expected to cost approximately $325 million. The City has said that it is investing $55 million in infrastructure upgrades, including building 10 new ferry landings and rehabilitating six others; and that it is also providing $30 million in operating support per year, over a period of six years.